The M48 Highland Sgian takes the traditional Scottish dagger and gives it a sleek, modern look. 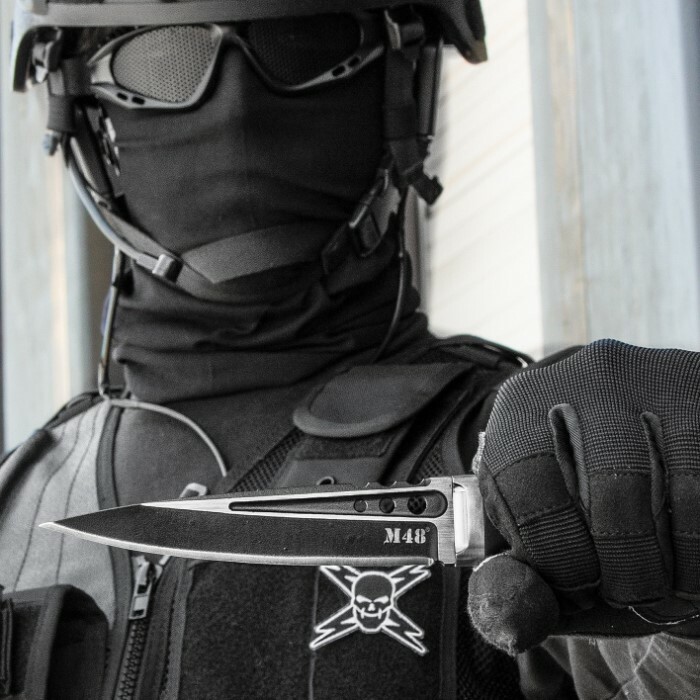 This dagger really has a tactical feel, with a 5 1/4" 2Cr13 black oxide coated stainless steel blade with a satin surface grind. The blade is accented with three through-holes that lead up to the stainless steel guard. The handle is black TPR - molded to fit comfortably in your hand. A molded sheath with a polypropylene inner cover is included to house the blade, and a double layered nylon strap keeps it anchored firmly in place. Strap the sheath to your belt, and you're ready to go! I bought two of these knives. One for me and the other one ...for me as well. The point is wickedly sharp!! I just love looking at it. The handle is just right for my hand. My only minor issue is that I wish it had more of a hollow grind along the cutting edge. The blade is certainly thick and I'm positive it will stand anything thrown at it, but I'm not to thrilled that the cutting edge tapers to a semi sharp edge. 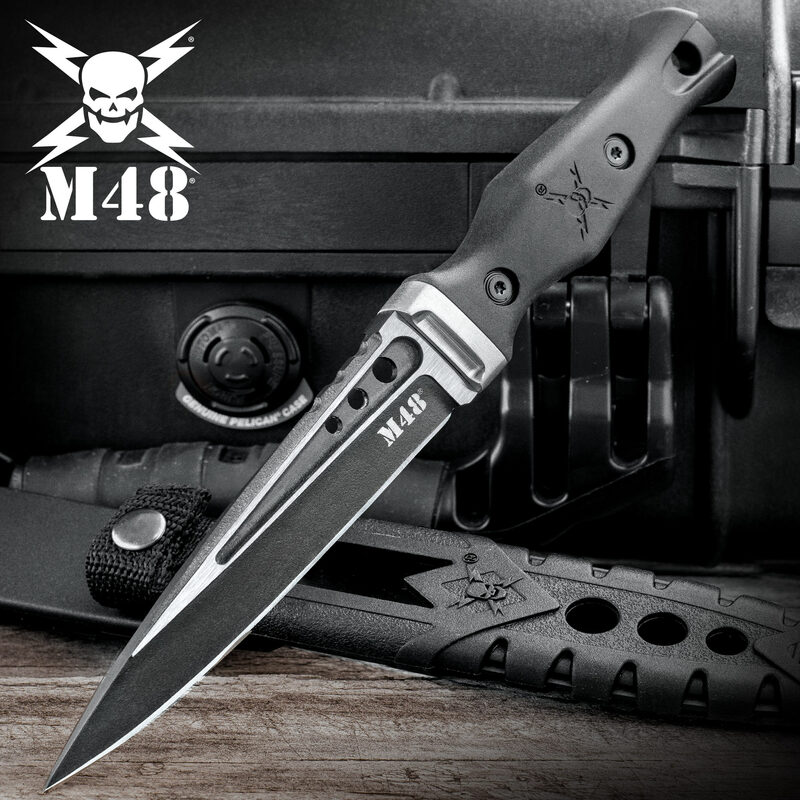 Overall absolutely great knife to have, and a big fan of the M48 series. I bought this m48 knife for my zombie apocalypse survival kit. It is well made and very sharp. I am very happy with it. I bought one cause I liked the style and wanted it. Received it and was pleased, it has a sharp edge and everything about it is solid. From sheath to the knife is well made , I recently ordered another one cause so impressed with this knife. This knife is fine, good looking, well made, and has a good thick blade that is quite sharp. However, the snap on the holding strap was so hard to undo, I had to cut it off. The only way I could open it was with pliers, or a screwdriver. I'm very impressed with the quality of this dagger.Very sharp point and blade.I like it so much will probably buy another one engraved for my son. VERY thick blade with a wicked point. Gets "Oooh's" & "Ahhh's" from everyone I've shown it to. Slightly smaller than expected-especially the handle, but still glad I bought it! Good knife. Put together strongly and keeps a sharp point.